“Ang Supremo” is a 3-meter tall brass-bronze statue made by Ben-Hur Villanueva which gives life to the event wherein the Katipuneros with Andres Bonifacio tore up their cedulas in protest of the Spanish ruling over the land of the Philippines. There's a second figure who is Lakambini, the wife of Bonifacio, holding a flag. 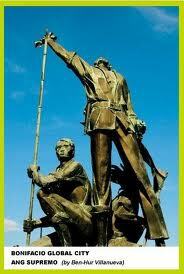 And the last figure is a Katipunero and a member holding a spear. 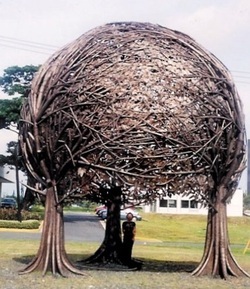 Sculpted by Reynato Paz Contreras, The trees is 6.5-meter tall sculpture composed of three interlocking trees representing the circle of life. The branches, as everybody says, represent stability. 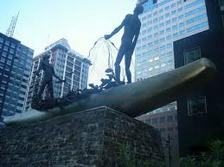 A 16-meter work of reinforced brass sheet and cement created by Juan Sajid de Leon Imao. It is surrounded by seven paper-like dolls representing the 7,100 islands of the Philippines. A kinetic sculpture which is composed of three sails that represents the 3 island groups - Luzon, Visayas, and Mindanao moving in the path of the wind.